Probably the most common dreadlocks product. Dread wax is used to start dreadlocks and maintain them so they look clean and healthy. Dread Wax should have a strong hold so you can keep your dreadlocks together while they are forming. Wax products should be thicker and are usually yellow or white. An alternative to dread wax, dread cream is extremely easily apply and can condition dreadlocks. Although most dread creams don’t have much hold, some creams containing lanolin can usually hold down loose hairs. Moisturizers are usually added to bar soaps to try and counteract the drying effect of bar soaps. Bar soaps cause your skin to lose of the protective oil layer and increases the chances of irritation. Transparent soaps will have a high glycerin content and this tends to absorb water out of the skin, potentially causing more irritation. Fragrances are commonly used to conceal the odors of the raw ingredients of soaps. Some individuals will be sensitive and become allergic to these products. A small residue will remain on the skin, which may inhibit bacteria. Shampoos that are liquid are easy to work with and apply to your dreadlocks. The best kind of liquid shampoo to use when you have dreadlocks is residue free dread soap. Liquid soaps are definitely the way to go when you have dreadlocks. Dry shampoos are usually used in between washings. It’s important to understand what a dry shampoo is and what it does. Dry shampoo’s are not really shampoos, and they are not really washing hair. They are usually made up of alcohol, and when sprayed on the scalp and allowed to evaporate dry shampoo’s usually make your scalp feel cleaner, although the really aren’t removing dirt. Dread Accelerating products are great for speeding up the locking process. You can also use accelerating products to cut down on the amount of maintenance you have to do to care for your dreadlocks. The most popular and effective dreadlocks accelerating products come in spray form, so you can easy apply it to all of your dreadlocks. Some new dreadlocks accelerating products have come out in powder form. Although you wouldn’t normally think they would be very effective, some of them have great drying properties. Dread Beads add a lot of style to your dreadlocks. You can get beads in many different styles ranging from glass to wood to bone to clay. You can get them in many different sizes and shapes with all kinds of designs. Peyote stitches are a type of dreadlock bead that are usually not thought off. Probably the most popular dreadlock hat on the market, the dread tam hold dreads back and out of your face. There are a variety of different dread tams with different sizes, colors, and fabric types. Some dread tams are light weight, usually cotton, for hot weather and some are heavier, usually made from acrylic. Although the dread tam is probably the most popular dread hat there are other dread hats that are very versatile. Dread bands and dreadlocks visors are great for holding your dreadlocks out of your face but still showing your dreadlocks off. 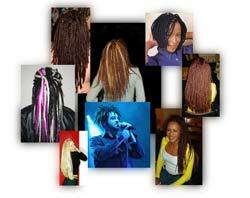 Dread bands can be made of out many different materials, they can be woven, knitted, or crocheted.